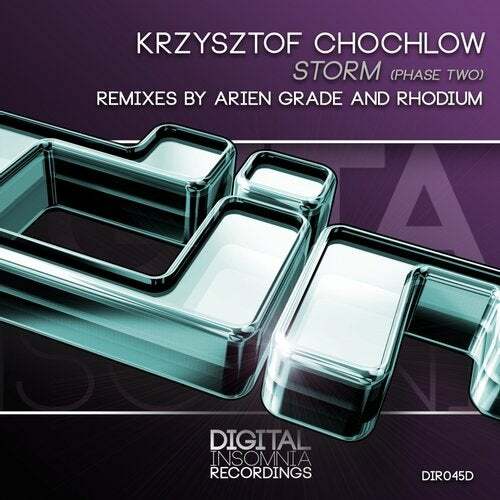 Digital Insomnia Recordings are back with Phase Two of 'STORM' from Krzysztof Chochlow. The Original 'STORM' track was a Tech Trance and Electro House track with a driving electro beat, fused with merciless percussion, uplifting stabs and subtle bass FX. Phase Two comes with two Trance Remixes to present from Arien Grade and Rhodium. Arien Grade lifts off with some modern progressive trance synth layered rolling beats, stabs and FX; slowly introducing elements of the original STORM riff. Lifting off with a dark style Trance riser that hits back again with progressive hard beats, into a monster outro. This is a must have track for those Dark Mainroom Trance events. Rhodium delivers a traditional old skool style Uplifting Trance remix, kicking off with rolling bass and beats into an acid guitar layered synth riff. Introduction of the main riff soon makes an appearance leading into a reverb chambered pad driven exotic and melodic breakdown. Strings and trance plucks drive through the breakdown, layering back to an eastern vocal FX and drop back into hard driving beats. One for the traditional high tempo Uplifting Trancers out there.